Assistant, Laboratory Assistant, Fitter, Cabin/Room Attendant, House Keeper and other Apprentices in respective trades at its offices / Rigs / Installations/ Workshop in Cambay and Hazira of Andhra Pradesh under Apprenticeship ACT 1961. 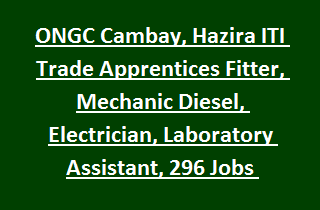 There are total 296 ITI Trade Apprentice Trainees vacancies available in ONGC Cambay/Hazira Recruitment 2019. Eligible/ Interested candidates are required to submit their filled applications on or before 28th March/2019 to the ONGC Cambay/Hazira. The selection process for this ONGC Cambay/ Hazira ITI Trade Apprentices recruitment will be based on candidate academic marks percentage. Full details regarding Available vacancies, Age details, eligible criteria, Training period, Pay scale, Educational qualifications of ONGC Oil & Natural Gas Corporation Limited Cambay/Hazira Recruitment ITI Trade Apprentices Jobs notification are stated below. Total Vacancies available in ONGC (Oil and Natural Gas Corporation Limited) Cambay, Hazira Recruitment are 296 posts. Vacancies available in ONGC Cambay: 115 posts. 1. Mechanic (Diesel): 20 posts. 2. Machinist/ Turner: 07 posts. 3. Mechanic (Motor Vehicle): 02 posts. 5. Computer Operator & Programming Assistant: 03 posts. 6. Cabin/ Room Attendant: 01 post. 9. Electronics Mechanic: 01 post. 10. House Keeper (Corporate): 02 posts. 11. Instrument Mechanic: 05 posts. 12. Information Technology & Electronics System Maintenance: 02 posts. 13. Laboratory Assistant (Chemical Plant): 04 posts. 14. Secretarial Assistant: 12 posts. 15. Store Keeper: 01 post. 16. Welder (Gas and Electric): 09 posts. Vacancies available in ONGC Hazira Recruitment are 181 posts. 4. Boiler Attendant: 03 posts. 8. Information Technology & Electronics System Maintenance: 04 posts. 10. Instrument Mechanic: 16 posts. 11. Mechanic (Motor Vehicle): 04 posts. 13. Machinist/ Turner: 06 posts. 14. Mechanic Diesel: 20 posts. 15. Secretarial Assistant: 09 posts. 16. Welder (Gas & Electric): 04 posts. After selection candidates will be offered monthly stipend as per Government rules. Fitter, Electrician: Candidate must have passed 10th class (10+2 system) and ITI pass in respective trade. Mechanic: Must have passed 10th class or equivalent educational qualification and ITI pass in Mechanic (Diesel). Training duration is 02 years. Laboratory Assistant: 10th class pass under 10+2 system with Science subjects or equivalent qualification and BSC with Physics & Chemistry/ ITI in Laboratory Assistant (Chemical Plant). For all posts Training period is 01 year (Except Secretarial Assistant- 1 1/2 year). Please follow the ONGC notification for more qualification details. Candidate Age limit for the current recruitment is 18 years to 24 years as on 28-03- 2019. Selection of candidates for ONGC recruitment will be based on their marks percentage in academic qualifications in respective trade.